When The Steel Wheels played at the Rose Garden Coffeehouse in Mansfield two years ago, they participated in a charity bike ride to raise money for a Stage 4 cancer patient. We thought they were special then, but now we know it. They return to the Rose Garden Coffeehouse in Mansfield on Saturday, March 15, for an 8:00 pm show. Since playing at the Rose Garden, these four guys from Virginia’s Shenandoah Valley have taken the country by storm with their own energetic brand of Americana acoustic music. But a funny thing has happened over the past few weeks. We received a call from a woman in Kansas who persuaded her husband to take her to Boston for the weekend and to celebrate her birthday at our Steel Wheels show. Another woman called from New Jersey with a heartfelt story of how her adult daughter had been completely enamored of The Steel Wheels and had become friends with all of them. Her daughter passed away some months ago and as a tribute she is bringing a group of 20 people all the way from New Jersey to see them at the Rose Garden. This group is as nice and unassuming as they are talented. NPR Radio has said of their music, “Americana, made by hand.” Their style has obvious appeal and has resulted in a rapidly expanding fan base and bookings at prestigious events such as Merlefest and the Grey Fox and Thomas Point Bluegrass Festivals this year. The band is renowned for their raw energy and chemistry on stage, where they often cluster tightly around a single microphone to adorn Trent Wagler’s unmistakable tenor with bell-clear four-part harmonies inspired by their shared Mennonite heritage. Add to this Eric Brubaker’s evocative fiddle, Brian Dickel’s grounded upright bass, and Jay Lapp’s signature mandolin style, and it’s no surprise that The Steel Wheels have enthralled the contemporary Americana scene. The band’s latest video may be seen here. The song on the video will be officially released on April 1 as the B Side to a 7″ Vinyl Single project the band has coming out. At The Steel Wheels’ first Rose Garden appearance, they were virtual unknowns in the area. But a lot has changed since then and we are expecting a large, vociferous, and welcoming crowd to help us continue our 25th Anniversary Season. 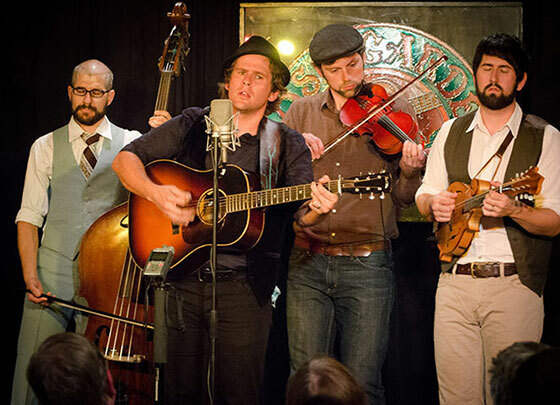 Some tickets may be available at the door at 7:30 pm on March 15, but advance reservations are strongly recommended through the website at www.rosegardenfolk.com where plenty of additional information about the group may be found. Mac McLanahan is a Rose Garden Coffeehouse co-founder and its artistic director. The Rose Garden Coffeehouse is at the Congregational Church, 17 West St., Mansfield, Mass.